Last week, Morgan Stanley's chief US equity strategist, Michael Wilson, doubled down on his reputation as one of Wall Street's biggest bears, when having predicted much of the market turbulence in 2018 - which most of his peers missed - he again warned that with (1) valuations still too high and (2) earnings downside even greater than what has been priced, he expects some further deterioration in US economic data, and thinks "the S&P 500 will suffer a re-test of the lows we experienced in December, but on less negative momentum and better breadth." Fast forward to this weekend, when in Morgan Stanley's "Sunday Start" note, Wilson triples down on his warning, and urges clients to cash out of stocks ahead of an imminent retest of the 2018 lows. We republish his note "Wait for the Retest" below, with highlights. 2019 has begun as strongly as 2018 ended badly. After the worst December since 1931, we’re on track for one of the best Januarys ever, with the MSCI All Country World Index up 4.5% and every region participating. Unfortunately, we don’t think this will hold up because the things we, and the market, have been worrying about for the past six months are now taking shape and turning out to be worse than we expected in some cases. Specifically, economic growth is decelerating sharply and corporate earnings are being revised lower at a rate we haven’t seen since the global recession in 2015-16. Speaking of earnings, 4Q reporting season began last week. While it’s way too early to draw any conclusions, the EPS beat rate so far for the S&P 500 is only +0.75% – the lowest since 2016. As usual, financials have dominated the first week of reporting season, and this quarter the results are essentially coming in line with expectations which, in today’s world of managed earnings, amounts to a miss. Despite these weak results, financials were the best-performing sector on the week, both in the US and globally. After a stretch of terrible performance in a stock or an index, positive price action on bad news can often be a strong buy signal, as it suggests the bad news is already in the price. In fact, it’s something I’ve been waiting for to get more constructive and blow the all-clear whistle for US equities more broadly. However, I can’t help but think that from this perspective, the strength in financials might be a bit of a trap. First, US financials were one of the worst performers last year, reaching their lowest valuations since 2011, a time when it wasn’t clear whether many of these companies would survive. In short, more was “in the price” for financials by the end of 2018 than perhaps any other sector. Second, earnings revisions have not yet troughed, in our view, and many companies have yet to report whose stocks are not pricing in bad results. Finally, the deterioration in the economic data is accelerating, thanks to the US government shutdown, ongoing trade uncertainty, unsuccessful Brexit negotiations and continued Fed balance sheet reduction. Back in September, our call for a 2019 earnings recession in the US was out of consensus. But now that stocks have corrected and earnings are being revised lower, others are beginning to embrace our view and clients are starting to ask what the chances are that this turns into an economic recession. 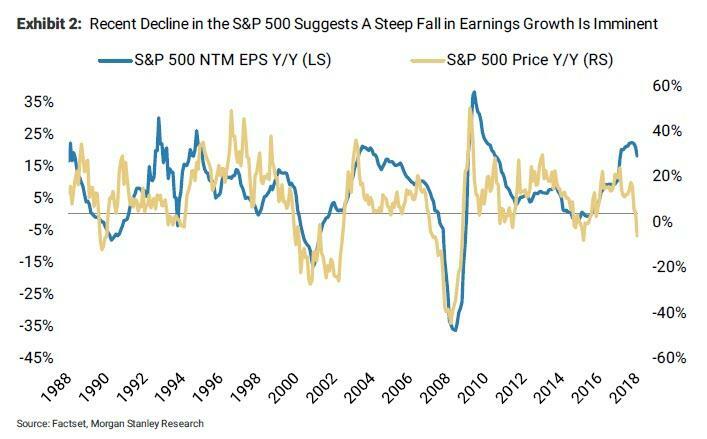 Our response has been that it doesn’t really matter to us because an earnings recession is the same thing to the market and it essentially got priced in this past December. I don’t know of a single prognosticator calling for an economic recession, but if that view gains traction, it’s likely to be a buying opportunity, not a time to sell. The moment of recognition by the consensus of either bad or good news is typically the time for investors to go the other way. As an example, think about last year’s euphoria around tax cuts. The consensus got excessively bullish in January, precisely the wrong time. I think we could be setting up for the exact opposite situation this year as the negative news flow reaches a peak. December’s sell-off was scary, with a large majority of stocks pricing in a recession and breaking support on very high volume. Some of this was due to poor Fed communication and tight year-end liquidity, but we also think the market was coming around to our view on earnings recession risk. In technical terms, this was a momentum low. Typically, the market needs to revisit that low on price but with less momentum to mark a definitive buying opportunity. We call that a retest, and it usually happens when the bad things the market has been worrying about become so glaring that they’re in every headline. We think this time is no different and expect to see a retest as economic and earnings data deteriorate while concerns linger around the trade deadline and the Fed’s balance sheet reduction. Our advice is to lighten up here as the market rallies and wait for a retest of the December lows on what may seem like scary fundamental news, mixed in with more political theatre. In addition, we think the stocks that have been hit the hardest will prove to be the best buys as the rolling bear market turns into a rolling bottom. Think of it as a First-In, FirstOut (FIFO) process. Indeed, the recent strength in higher-beta stocks like financials, homebuilders and energy means they fit the bill. We just think you’ll get a better chance to buy them lower, along with most other stocks.